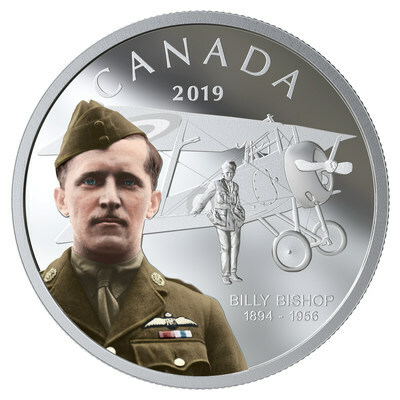 OTTAWA, Feb. 8, 2019 /PRNewswire/ - This month, the Royal Canadian Mint tells a story of valour in combat with a tribute to Canadian First World War flying ace Billy Bishop. This fine silver coin continues the Mint's proud tradition of preserving the memory of the heroic men and women behind Canada's military history. Born 125 years ago, the talented airman from Owen Sound, Ontario, recorded 72 confirmed kills as a Royal Flying Corps fighter pilot in the First World War. He was awarded the Victoria Cross for his single-handed attack on a German airfield near Cambrai, France, on June 2, 1917. His fame grew further when he was believed to have shot down the infamous Baron Manfred von Richthofen - known as the Red Baron.